Nickyanka united with the Jonas family in London a few days before Christmas for lunch and dinner parties with family. Priyanka Chopra and Nick Jonas are making the most of the precious winter holidays ahead of New Year. 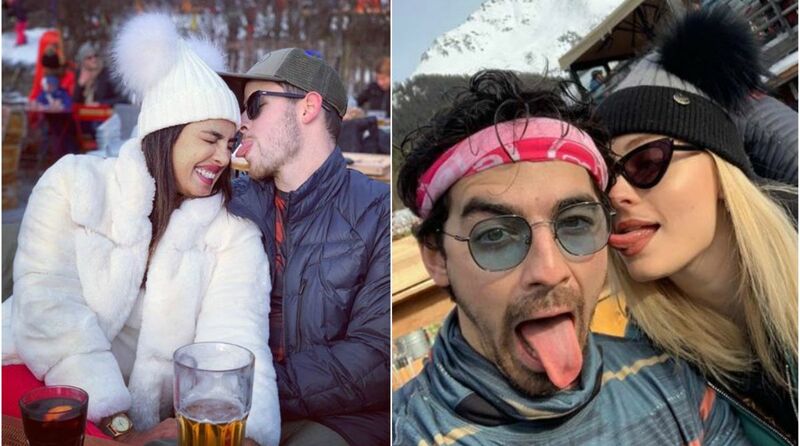 The newlyweds are currently on a ski vacation with the Jonas brothers along with Sophie Turner, Joe Jonas’s fiancée, in Switzerland. The Jonas family is now on their New Year vacation in snow-capped mountains with picturesque views. Nick also shared a few pictures of the Jonas gang with the caption, “The mountains, my love, family, and friends.” The picture shows Priyanka, the Jonas brothers and Sophie. The mountains, my love, family and friends. READ MORE| Disha Patani and Tiger Shroff’s beach holiday pictures are worth watching! Apart from these, videos are surfing on the internet of the family. In a boomerang video, Priyanka and Sophie, are seen swinging their heads in their cute winter caps and captioned it as, “J sisters”. While in another video, the Jonas brothers with Sophie are trying their hands at ski shots. Before the Jonas family took off for a vacation in Switzerland, they spent quality time with their families in London. Priyanka and Nick got married on 1 and 2 December in both Christian and Hindu ceremonies in Udaipur.